For every crane that Link-Belt introduces, a significant amount of customer input goes into its design. Whether customers are visiting the plant to take delivery of a new crane or attending training, Link-Belt product managers and engineers ask questions about their wants and needs for new products. Before the 100RT rough-terrain crane was introduced in 2015, the voice of the customer played a significant role in its development. At ConExpo-Con/Agg, Link-Belt will introduce the second product in the next-generation RT series, the 75-ton 75RT, which will incorporate many of the characteristics of the 100RT, as well as a range of new features specific to this model. The 100RT will also be upgraded to the 110RT and will be on display at ConExpo-Con/Agg 2017. The 75RT has a five-section, 142-ft., full-power boom, which is formed at the company’s headquarters in Lexington, Ky. It features two extend modes to keep the lifting process simple for the operator. A 35- to 58-ft. two-piece and 10-, 35-, and 58-ft. three-piece bi-folding fly are both available, providing for a maximum tip height of 208.7 ft. The matching main and auxiliary winches have 18,603 lbs. of maximum line pull and a maximum winch speed of 485 fpm. The six speed, automatic transmission on the 75RT is powered by a 270-hp Cummins Tier 4F QSB 6.7 diesel engine, which is the same power train used on many other Link-Belt RTs. “We focused heavily on transportability on this machine and you can load this machine up with every option that we have, and still transport below 100,000 lbs.,” says Brian Smoot, Link-Belt’s rough-terrain crane product manager.” In parts of the world where the crane needs to be less than 90,000 lbs. for transport, users can achieve this by removing a single-slab 14,500-lb. counterweight. The 75RT has an overall height of 12’2”, and it can be driven off a conventional lowboy trailer and be ready for work once the counterweight is assembled. Another new feature of the 75RT is the evolution to a 24-volt electrical system. Smoot says it provides a more reliable electrical system, prevents any voltage drops that may be present in a 12-volt system, and reduces the size of wiring harnesses. Multiplexing with these modules allows for crane functions to be isolated allowing operation to continue while another system is being diagnosed or serviced. If a function is down, a control box is available to plug directly into the valve to override the function that is down. The new Link-Belt RCL control system, Link-Belt Pulse 2.0, includes a simple interface with a 10-in. display—a 47% larger screen than the original Pulse—and programmable features that allow each operator to customize the display. The resistive touchscreen can be used with gloves and be seen in direct sunlight with larger, clearer images. The display is pivot-mounted for optimal viewing, and the interface is more dynamic with larger buttons and interactive indicator lights displayed on the margins. Link-Belt also now offers the ability to self-diagnose the crane with the Link-Belt Pulse 2.0 operator control system. Link-Belt Pulse 2.0 includes a Wi-Fi hub and can be updated remotely. It uses the serial number of the unit to determine whether any updates are available and downloads/installs to the appropriate controls. For the past 18 months, Smoot says they have been developing a new operator’s cab that will be first incorporated in the 75RT. Its design also relied on the voice of the customer to ensure that the controls, seat, and other components were ergonomically placed with plenty of visibility for the operator. Updates include a front window with 20% more visibility and windshield wipers that go to the top, customizable arms and a more comfortable operator’s seat, improved interior lighting, and a 20° tilt. Other cab features include USB port and a 12-volt power supply. Testing the updated HVAC system allowed for Link-Belt to simulate comfort zones in the operator’s cab. “With more glass, you’re getting more sunlight, so we made sure we can heat or cool down the cab and maintain the temperature,” Smoot says. Similar to a car, the automatic temperature control provides a thermostat that regulates and keeps the temperature steady. Once in the seat of the cab, startup is quick with faster hardware/software response, as well as fewer required operator inputs. Electronic level/list display and ground-bearing calculator are integrated, depending on the model. One specific feature added based on operator input is the ability to shut off the engine and still maintain the Pulse 2.0’s live display data for an extended period of time. The 75RT will be the first Link-Belt crane model to incorporate the variable confined area lifting capacities, or V-CALC. The new feature provides more selectable outrigger configurations. Charts for the increased number of outrigger configurations are built into Link-Belt Pulse 2.0. Once outriggers are set, the system provides an outrigger configuration that gives the operator different capacity previews on the display. Colored pie charts on the screen represent workable areas and also indicate a percentage of the crane’s available capacity. Besides highlighting available working capacities, the system previews the next five radiuses for that given boom angle. Upon selection, Link-Belt Pulse 2.0 will provide a live view of the work area. Because RTs are predominantly used in the bare rental market, the need for a machine that is easy to operate and service is crucial. “A lot of times, the operator is going to a remote location, so we want to make it easier for them to diagnose any issues and relay that information, so the maintenance can be done quicker,” Smoot says. Routine checks on powertrain components and fluid levels can be made through large swing-out doors and a centralized location for fuses, relays, and breakers. A centralized pressure check and grease bank located near the cab allows an operator to monitor multiple pressure and fluid workings from one location and several hard-to-reach grease points have been eliminated. Foldable access ladders and upper guardrails are used to provide reinforced safety boundaries. Link-Belt will also offer Eco Mode on the 75RT. First introduced on the TCC Series telescopic-boom crawler cranes, the next-generation RT’s engine will automatically drop down to 700 RPM If the crane is idle for more than 15 seconds. When the operator is ready to work again, any control will automatically bring him back up to the RPMs the engine was previously at. The function can be turned off, if desired. 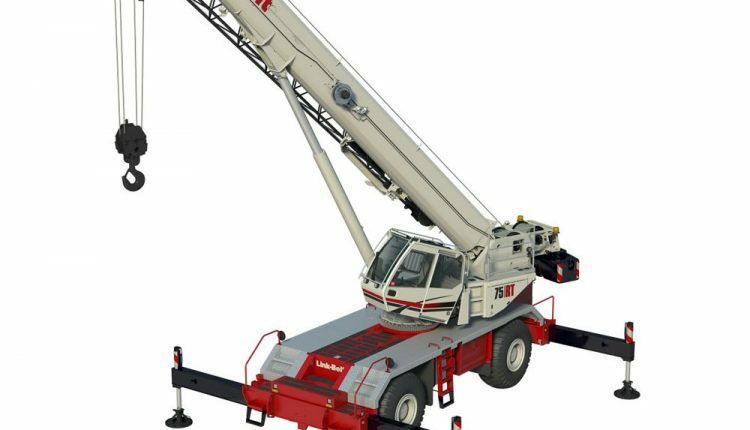 In addition to the 75RT rough-terrain, Link-Belt will show the upgraded 110-ton 110RT, 110-ton HTC-86110 hydraulic truck crane, new 130-ton 228 HSL and updated 250-ton 298 Series 2 lattice-boom crawler cranes, 250-ton TCC-2500 telescopic-boom crawler crane, and Pulse 2.0 crane operating system for the first time at ConExpo-Con/Agg. The base rating increase of the 110RT brings it in line with the 110-ton HTC-86110 telescopic truck crane. Both machines share many of the same components, including a six-section, 164-ft. main boom. Models reflecting the new larger capacity will begin shipping immediately, as no physical changes to the machine were necessary, which will also allow 100RT units already working in the field to be upgraded with minimal requirements.